Been doing some A2 revision courses this holidays and this question came up. In the last two November A2 exams there have been multiple choice questions concerning the point on the Total Cost curve when MC, AVC, and ATC are at their lowest point. In the graph note the corresponding points on the Total Cost. They usually ask you where on the Total Cost line is the lowest point on the MC curve/AVC curve etc. MC cuts ATC and AVC at their lowest points. The firm will supply where the price is greater than or equal to MC. Thus the individual firm’s supply curve consists of the firm’s MC curve, but only the portion above AVC . The reason for this is that where P=AVC the firm will shut down operations because they are barely covering avoidable costs. This entry was posted in Exam revision and tagged Cost Curves on November 2, 2018 by Mark. With the A2 exam not far away here is something on Economies of Scale – also a mind map which I have edited from Susan Grant’s book. When the average cost curve slopes downwards it means that average costs are decreasing as output increases. Whenever this happens the firm is experiencing economies of scale . If on the other hand the average costs are increasing as output increases the firm is experiencing diseconomies of scale . Why do firms experience economies of scale? Technical Economies: large firms can take advantage of increased capacity machinery. For example, a double-decker bus can carry twice as many passengers as a single decker bus. But without the purchase costs and the running costs are not doubled. Managerial Economies: In a small firm the manager may perform the role of cost accountant, foreman, salesman, personnel officer, stock controller etc. However, as a firm increases in size it can take advantage of specialisation of labour. Commercial Economies: The large firm can buy it raw materials in bulk at favourable rates. Financial Economies: the larger firm can negotiate loans from banks and related institutions easily and at favourable rates. Risk-Bearing Economies: All firms are subject to risk at sometime or other. However, the larger firm has distinct advantages in this area as small changes in supply and demand can often ruin a small company and larger firms can cover itself by producing a variety of products for a variety of markets. This entry was posted in Micro, Uncategorized and tagged Cost Curves, Economies of Scale on September 26, 2018 by Mark. I went through this graph with my A2 class. Note that the firm’s short-run supply curve starts at P4. Useful for multiple-choice questions. This entry was posted in Exam revision, Market Structures and tagged Cost Curves on September 8, 2017 by Mark. Having just completed Perfect and Imperfect Competition with my Year 13 class I used a couple of packets of M&M’s to drum home the concept of marginal analysis MC=MR. It has always been something that students have struggled with but I am hoping this experience of creating graphs with M&M’s might help their understanding and when to use the concept. Profit is maximised at the rate of output where the positive difference between total revenues and total costs is the greatest. Using marginal analysis, the firm will produce at a rate of output where marginal revenue equals marginal cost. Below are a few of the graphs done using M&M’s. This entry was posted in Market Structures and tagged Cost Curves, Perfect Competition on August 15, 2017 by Mark. Having just completed Perfect Competition with my A2 class I used a couple of packets of M&M’s to drum home the concept of marginal analysis MC=MR. It has always been something that students have struggled with but I am hoping this experience of creating graphs with M&M’s might help their understanding and when to use the concept. Profit is maximised at the rate of output where the positive difference between total revenues and total costs is the greatest. Using marginal analysis, the perfectly competitive firm will produce at a rate of output where marginal revenue equals marginal cost. Marginal revenue, however, is equal to price. Therefore, the perfectly competitive firm produces at an output rate where marginal cost equals the price of output. Remember that the firm will make profits as long as the extra revenue brought in from selling the last unit of output(MR) is greater than the extra cost which is incurred in producing it(MC). Below are some of the graphs they created – perfect competition normal profit, subnormal profit, supernormal profit and the firm and the market for long-run perfect competition. This entry was posted in Market Structures and tagged Cost Curves, Perfect Competition on August 4, 2016 by Mark. Average Variable Costs (AVC) : the form it takes is U-shaped: first it falls; then it starts to rise. It is certainly possible to have other shapes of the AVC. Average Total Costs or Average Costs (ATC or AC) : similar shape to the average variable cost. However, it falls even more dramatically in the beginning and rises more slowly after it has reached a minimum point. It falls and then rises because average total costs is the summation of the AFC and the AVC curve. Thus, when AFC plus AVC are both falling, it is only logical that ATC would fall, too. At some point, however, AVC starts to increase while AFC continues to fall. Once the increase in the AVC outweighs the decrease in the AFC curve, the ATC curve will start to increase and will develop its familiar U-shape. Where MC = ATC this is the lowest point on the ATC curve and is therefore the cheapest production for the firm. This is called the technical optimum. 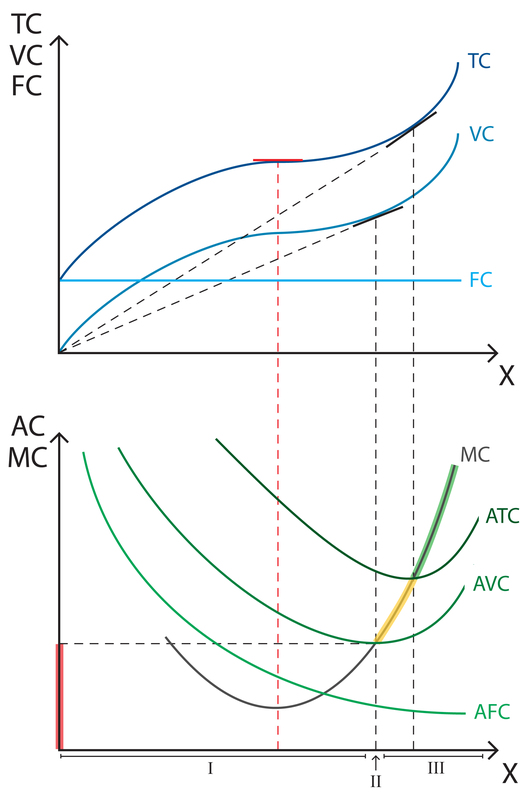 Marginal Cost (MC) : it cuts ATC and AVC at their lowest points. The firm will supply where the price is greater than or equal to MC. Thus the individual firm’s supply curve consists of the firm’s MC curve, but only the portion above AVC. The reason for this is that where P=AVC the firm will shut down operations because they are barely covering avoidable costs. This entry was posted in Exam revision and tagged Cost Curves on May 20, 2016 by Mark. This entry was posted in Market Structures and tagged Cost Curves, Perfect Competition on August 4, 2015 by Mark. This entry was posted in Market Structures and tagged Cost Curves, Perfect Competition on April 2, 2015 by Mark. US – China trade war. Who has the power? Macleans on Is the Natural Rate of Unemployment in the US lower than economists think? IMF calls for Germany to change its trade policy | econfix on Germany’s current account surplus – a concern?